Prepare the marinade by combining all the ingredients in a blender, and blending on high speed until smooth and thick — about 90 seconds. In a large bowl, toss the zucchini chunks with 1/3 cup of the marinade. Set aside. Pour the remaining marinade over the chicken and toss to coat. 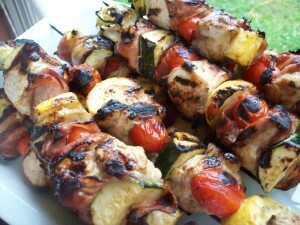 Refrigerate both the chicken and the zucchini and allow them to marinate for a minimum of 1 hour or up to 8 hours. When you’re ready to assemble the kebabs, cut the artichoke hearts in half lengthwise. Set out 12 skewers (if using bamboo skewers, you’ll want to have soaked them in water for about 20-30 minutes first so they don’t burn). Begin by piercing the end of a strip of prosciutto with a skewer. Push the prosciutto down just an inch or so and follow it with a piece of zucchini. Fold the long end of the prosciutto over and secure it with the skewer — what you want to do is essentially use the prosciutto slices like an accordion, weaving back and forth between the other pieces of the kebab. As each slice runs out, you can begin another one on the skewer. Add a piece of chicken, fold the prosciutto over, then follow it with a grape tomato. Fold the prosciutto over that, secure it, and repeat the pattern: Zucchini, prosciutto, chicken, prosciutto, tomato, prosciutto. When there are three pieces of zucchini, three chunks of chicken, and two tomatoes on the kebab, finish with half an artichoke heart on the end of the skewer. Set the finished skewers on a platter. When you’re done with all the kebabs, cook them on a hot grill for about 15 minutes or just until the chicken is cooked through and the zucchini is tender, turning frequently to keep them from burning. Serve with rice, cous cous, or quinoa.